Chibiusa was the civilian identity of Sailor Chibi Moon, and she appeared in the anime and manga series. Her real name was Usagi, but to prevent confusion, people called her "Chibiusa" ("chibi" (ちび) meaning "small person"; "usa" (うさ) being short for "usagi" (うさぎ; "兎" in kanji), meaning "rabbit"). In Crystal Tokyo she also went by the name Usagi Small Lady Serenity. Chibiusa belonged to the future, 30th-century Crystal Tokyo, and travelled back in time to 20th-century Tokyo initially to save her mother and again later in the story for training as a Sailor Senshi. She was the daughter of Neo-Queen Serenity and King Endymion, the future forms of Usagi Tsukino and Mamoru Chiba respectively, and the granddaughter of Queen Serenity. She had a guardian device called Luna P, and a grey kitten named Diana, who was the daughter of the moon cats Luna and Artemis. When she first arrived in the anime continuity she was around 6 years old, while in the manga continuity she was chronologically 900, but still mentally and physically 6 years old. The delay in her aging was due to the power of the Silver Crystal and the fact that her own powers as a Senshi had not been fully awakened. 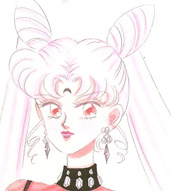 In the anime, before she gained the ability to transform into Sailor Chibi Moon, Chibiusa also had the power to emit a column of extreme energy from the crescent moon symbol that could appear on her forehead. She tended to do this when she was alarmed or scared, and the energy column was visible from a distance, which meant that the Black Moon Clan used it as a way of tracking her. Chibiusa first came into the continuity in the Sailor Moon R season, which corresponded to the Black Moon arc of the manga. She appeared as a child searching for the Silver Crystal to save her mother. She did not have any powers at the time, but she did hold the Key of Space-Time, taken from Sailor Pluto, which allowed her to go back into the past. After she was kidnapped by Wiseman, he aged Chibiusa into a woman who appeared to be in her teens or twenties and called herself Black Lady. Black Lady was brainwashed by Wiseman to fight with the Black Moon Clan against Sailor Moon and her allies. She later returned to her normal age, and in the manga, during the battle with the Black Moon, her powers as a Sailor Senshi were awakened and she became Sailor Chibi Moon (in the anime she simply assumed her "princess" form to fight). She helped to save her mother and then went back to the future. She returned again in the Sailor Moon S season to fight alongside Sailor Moon as Sailor Chibi Moon. Her mother sent her back both to train her as a Senshi and so that she could "make important acquaintances" (this was likely referring to her friendship with Hotaru Tomoe). She noted this background in her introduction dialogue, where she often stated that she was a Senshi "in training" who fought in the name of the "Future Moon" rather than just "the Moon." She remained as a regular cast member until Queen Nehellenia was cleansed in the fifth anime season, at which point she returned to Crystal Tokyo. In the Stars arc of the manga, she returned again along with her team, the Sailor Quartet, to rescue Eternal Sailor Moon, Chibi Chibi, and Princess Kakyuu. She returned to her normal timeline after the battle with Chaos. At Usagi and Mamoru's wedding some time later, Usagi informed her husband that their own timeline's Chibiusa was already on the way. In the Sailor Moon musical Kaguya Shima Densetsu and its revision, Chibiusa ran away to the 20th century to get away from her mother, whom she had begun to rebel against. This was described in several songs including "Chibiusa no Hanran" and "Okaasan te Nan darou?". Chibiusa's parents were the Queen and King of Crystal Tokyo, Neo-Queen Serenity and King Endymion. In Sailor Moon R, she went back to 20th-century Tokyo to find the Silver Crystal, which she believed would save her mother. Neo-Queen Serenity was encased in a crystal coffin following an attack upon Crystal Tokyo by the leaders of the planet Nemesis. In "Parallel Sailor Moon," she had a younger sister, Kousagi, who was also a Senshi. Her grandparents were Ikuko Tsukino and Kenji Tsukino, and she loved to play with her uncle, Shingo Tsukino. Chibiusa was fond of Helios/Pegasus in both the manga and anime series. He reached out to her throughout the SuperS season, and they developed a close personal relationship with each other. Once she and the other Sailor Senshi defeated Queen Nehellenia, she and Helios shared a kiss before he departed. In the Sailor Moon SuperS movie, she and Perle apparently had some feelings for each other, and she gave him a kiss on the cheek at the end of the movie. In Sailor Moon R, Chibiusa displayed symptoms of an Electra complex. In the alternate universe story "Parallel Sailor Moon," Chibiusa was seen on her way to cram school with Hotaru. This Chibiusa was only 15 years old (instead of over 900) and she dreamed of becoming a bureaucrat. Like her father, she wore glasses, and she took turns with her younger sister Kousagi in their duty to breed rabbits. Chibiusa nicknamed her sister "Chibi." This version of Chibiusa still bickered with Usagi. In the musicals, Chibiusa was played by Ai Miyakawa, Mao Kawasaki, Natsumi Takenaka, Tamaki Dia Shirai, Ayano Gunji, Arisu Izawa, Kasumi Takabatake, Noel Miyazaki, Aisha Yamamoto, Nanami Ohta, Mao Ohno, Mina Horita, Moe Oosaki, Kokoro Kuge, and Airi Kanda. She had four image songs, "Matamata Chibiusa Desu," "Pinky Typhoon," "Chibiusa no Kokoroiki," and "Chibiusa no Hanran." She was portrayed by fifteen actresses in the musicals, the most of all the Solar System Senshi, due to the fact that there were often two actresses who played her in one musical. Although Chibiusa was popular among young Japanese fans, there was notable dislike of the character within the Western fandom. Chibiusa's odango gave an impression of a rabbit's ears. This, together with her red eyes, pink hair, and pink sailor fuku, made her look like a pink rabbit. In the anime, Chibiusa's princess dress was identical in style to Princess Serenity's, but in the manga her dress was of a different design and color. Chibiusa's best subject in school was art. In the anime, Chibiusa was shown to have a fear of thunderstorms and needles. 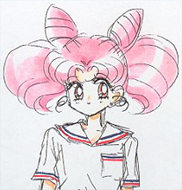 While Chibiusa did not appear in the live-action series, in the Special Act, it was implied that Usagi was pregnant. This page was last edited on 19 July 2018, at 10:57.